Probiotics exist naturally in some foods (such as some types of yoghurt and fermented vegetables such as pickles and sauerkraut), but can also be taken in dietary supplement form. But if you are otherwise healthy, here’s some simple advice: take what you spend on probiotic supplements, and use it to buy and eat more fruit and vegetables. 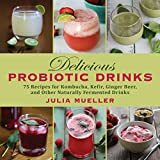 You are here: Home > Living > Health & Wellness > Food & Nutrition > Healing Diet > Should Healthy People Take Probiotic Supplements?